Publishers Weekly . 13/2/2017 . Three Envelopes is an Israeli thriller in which an apparently rogue agent of the government secret service outfit 'The Organization' resurfaces in the (then) near-future (2016; the novel originally appeared in Hebrew in 2014), a decade after he was responsible for part of a mission, called the Bernoulli Project, that got completely out of hand. Known only as 10483, the agent was supposed to have died a decade earlier, and the story opens with a leading member of The Organization receiving an envelope that he had deposited with a law firm back then, with specific instructions as to who to get it to exactly ten years later. The envelope contains a notebook, with entries starting in 1989, when the agent was still a child -- already obviously incredibly precocious, and already obviously deeply, deeply paranoid. The notebook is passed on to another man from The Organization, Avner, and most of the novel then moves back and forth between excerpts from the notebook, as Avner makes his way through it, scenes from the past described in the notebook, and the present-day, as Avner tries to confirm and learn more about those events from ten years earlier and about the mystery-agent. It also becomes apparent that 10483 is not dead -- and that's not a good thing. A psychopath, he has a big ax to grind, and there are clearly people in danger now. 10483 is a super-man of sorts, training himself, and then trained by The Organization to be a super-spy. He's incredibly smart -- especially with computers, which allows him to tamper with official and personal records, assuring his continued success and employment -- and he's trained himself to endure all sorts of physical and mental hardship. In retrospect, everyone wonders how he ever got as far in The Organization as he did -- even with his talents, the red flags should have been clear -- but then maybe some in the organization saw the usefulness of such a figure. And maybe they figured they had him sufficiently under control to ensure he'd burn out and fade away -- something that obviously did not go entirely as planned. The Bernoulli Project involved the targeted assassination of twelve prominent scientists and academics from all over the world. (The (debatable) reasons for the project are only revealed late in the story.) Protocol would dictate a single assassin be dispatched for each job, but -- intentionally ? -- 10483 gets three envelopes, assigning him three of the twelve targets. And he proceeds to do his job -- very well, since he's very good at what he does. Much of Three Envelopes follows 10483 as he trots the globe and tries to take out his three assigned targets. They are well-protected, but he is very creative. Very creative -- and apparently no one told him to worry about collateral damage. Because there is a lot of collateral damage to how he tries to take out these targets. On the one hand this is kind of fun -- certainly the ingenious (if ridiculous) plan he has for the first one -- but on the other, things do get rather out hand, and the final, Canadian assassination attempt is simply silly in its execution and excess. 10483 had done exactly what was expected of him. He had acted in accordance with the new system. The problem was that he had done so far too enthusiastically and with the mind-set of a psychopath. It's not just on his missions that 10483 is prone to excess. Domestically, his arrangements are also ... unusual. And certainly the neighbor who complained about a parking issue was ill-advised to do so. As to the two agents The Organization sends over to look in on him ... well, that really doesn't go well, either. He may be paranoid and a sociopath and suffer from crippling OCD, but he's not stupid. No, he definitely isn't. He's also surprisingly well-prepared for quite a lot of eventualities. The Organization generously provided while he was on the job, and there's enough left over for him to pick up where he left off, more or less. While Three Envelopes does get a bit silly in a lot of its excess -- and there is quite a bit of excess -- Hezroni does offer good, fun suspense, both of the immediate sort -- the various episodes, past and present -- and in the long game. It's all a bit much for a relatively short thriller, but it does offer good fun and a lot of creative (and quite creepy) thrills along the way and is certainly an entertaining pass-time thriller. [Note: The US edition does offer an amusing/annoying example of the dangers of relying on (and not fully understanding) some now-basic technology (and basics of how language and translation function). "Ein Glas Weizentrumpf, bitte." Carmit smiled at the bartender and placed a ten-franc note on the countertop. The bartender nodded and poured her drink. He offered her change but she waved it away. "Halten die Änderung." He nodded again and put the coins in the tip jar on the bar. What Carmit is supposed to be saying is the simple: 'Keep the change'. That's not what: 'Halten die Änderung' means -- or rather, 'Halten die Änderung' is a very literal (and grammatically not quite correct) word-for-word translation that translates 'keep' as 'hold' and 'change' not as the loose-coin-kind, but rather the alteration sort. What happened here ? Hezroni put 'keep the change' through Google Translate -- or rather, he put the Hebrew (equivalent (?)) through. If you Google Translate the English 'keep the change' into German you actually get a reasonable result -- 'behalte das Wechselgeld'. 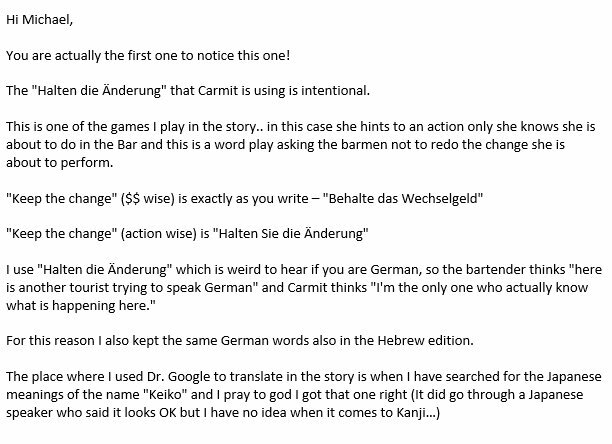 If you Google Translate the English 'keep the change' into Hebrew, you get 'שמור את העודף' -- and if you Google Translate that into German ... voilà, 'Halten Sie die Änderung'. Hezroni apparently felt it was safe to assume the English expression was similar in German -- and that a limited/strictly literal translation, even via a second language, was safe to use. (In Google he trusts !) But while 'behalte das Wechselgeld' is actually even closer, literally, than what he wound up with, his roundabout way of trying to find the right expression confused the terms. What's surprising is that he didn't do any other checks to see if he had gotten it right -- the obvious one being to Google, in quotes: "Halten die Änderung". You don't have to know German to realize from the results that something is off with that particular phrasing/expression. Truly shocking, however, is that neither the translator nor the English-language editors bothered to check, or to ask anyone, either. Again: a simple Google search should have alerted everyone that something was not right here. But maybe all they cared about was the spelling ? Israeli author Nir Hezroni (ניר חצרוני) was born in 1968.